Glass and window damage is not only aesthetically unappealing, but it also reduces the comfort and the security of a building. 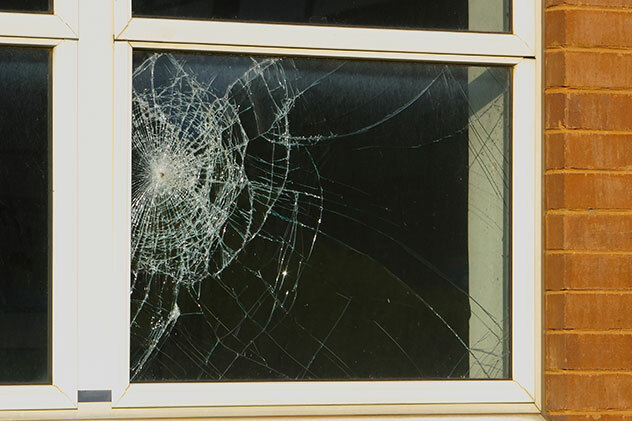 A broken window is a poor insulator and a potential draw for burglars and vandals. Because windows are such an important component of both residential and commercial buildings, it can be useful to know why and how they sometimes get damaged to the point of needing repair. Windows are a building's first line of defense against the outside elements. They are expected to stand up to wind, rain, snow, hail, extreme heat, and extreme cold. Seasonal changes and the rising and falling temperatures which accompany them can begin to wear away at the integrity of glass and windows. Humidity is of particular concern, as too much humidity inside the home can cause the window sash to deteriorate. Hamilton experiences significant seasonal temperature differences, high summer humidity, and year-round precipitation. All of this moisture can damage window components and even eventually lead to window glass cracking and breaking. Glass is used so extensively in construction because it allows in plenty of natural light, easy access to a fresh breeze, and because, for the most part, it can stand up to light physical impacts. Unfortunately, glass will shatter or at least crack if impacted by a hard object with enough force behind it. Glass often breaks as a result of human causes, such as wayward baseballs or intentional acts of vandalism. However, even large enough birds flying with enough speed have been known to collide with and shatter windows, as they often cannot see the glass. Finally, even though weather damage and physical impacts can significantly contribute to window damage over time, even the most well-maintained windows in the least damaging climates will eventually show signs of wear and tear. With enough age, all of the components used to make a window begin to deteriorate. Even window glass which has never been hit can develop cracks from too much expansion and contraction of the surrounding structures. Thankfully, damage to the windows and glass of your Hamilton home or business doesn't always call for an outright replacement. City Window & Glass can perform effective and lasting commercial window repairs and commercial glass repairs in Hamilton. With a solution so close at hand, there's no reason to let your windows remain an eyesore, a security risk, and a hindrance to your comfort. Don't wait any longer. Contact the trusted glass contractors at City Window & Glass and we'll take care of all of your window and glass repair needs.